Is Seeing A Headline With The Words "First Female" In It Empowering Or Depressing? Is Seeing A Headline With The Words “First Female” In It Empowering Or Depressing? It’s something we are well used to writing about here at GTHQ. The “first female” (fill in the blanks). We always get excited to hear about gender barriers being broken in any area. But in the year 2015, is it well overdue? Some would argue that it is a little depressing that there are many areas and industries waiting to get their own “first female”. Others would say it is empowering and inspiring to see women pioneering areas that have yet to reach equality in its representations. We tend to err on the side of “empowering” because it is important that more and more young girls grow up knowing there are no boundaries to what is possible for their future. There are a few stories that have been in the media lately that caught our eye because of the fact that they are about females making their presence felt in a place where it has been notably absent in the past. The first is here at home in the US. The Navy’s Blue Angels demonstration squadron is the second oldest aerobatics team in the world, and was formed in 1946. The oldest is the French Patrouille de France formed in 1931. 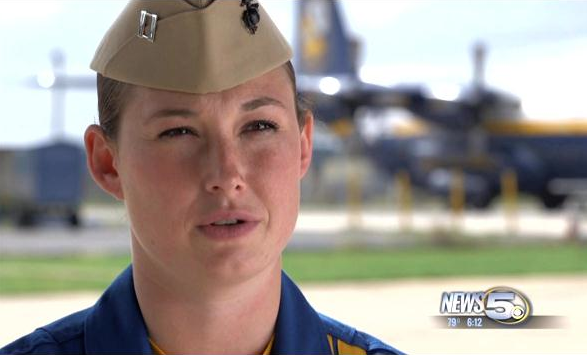 For the first time in its 69 year history, the Blue Angels have hired their first female pilot, Captain Katie Higgins which is a big deal and finally breaks their drought. The members of this elite squad are already enlisted in the Navy and Marine Corps, and are voted in each year by the existing Blue Angels members in a secret ballot. They are voted based on merit, which is why we find it a little odd that it has taken this long for a woman to be voted in. 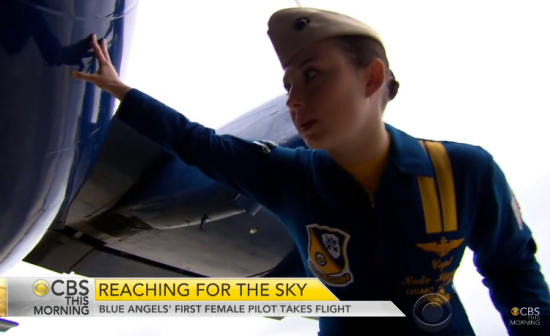 In the CBS News piece below, the Blue Angels Commander says there is no reason why women cannot fly these planes the same as the men and there is no institutionalized sexism amongst their ranks. Hmmm, that may not entirely be accurate, given CBS’ mention of a major sexual harassment scandal which happened last year in the squad and which may have led to this decision to finally vote in a female pilot. The Commander assures CBS’ Michelle Miller this isn’t the case. But our question is, did it really have to take a sexual harassment case and possibly a PR overhaul for this squad to recognize the value in promoting a woman? Did they seriously not have ANY viable candidates in the past, as good as Captain Higgins? “I think by including a lady on the team it shows little girls and guys that women can do whatever they put their mind to. Little girls have told me that they didn’t even know that ladies could fly aircraft,” she said in the CBS report. But as Michelle Miller points out, women have been in regular military cockpits for more than 20 years. Better late than never, it’s just a shame that with all the emphasis on gender equality and feminism in the world today, this choice could possibly have made in light of a sexual harassment claim. Moving further abroad to the country of Bhutan, they are celebrating a female first of their own: the first democratically elected female minister Dorji Choden. The Guardian reports that Bhutan has a population of 740,000 and is a mostly Buddhist nation. One of the unique factors about Bhutan is that it measures happiness along with economic growth, and Dorji’s election comes at a crucial time. 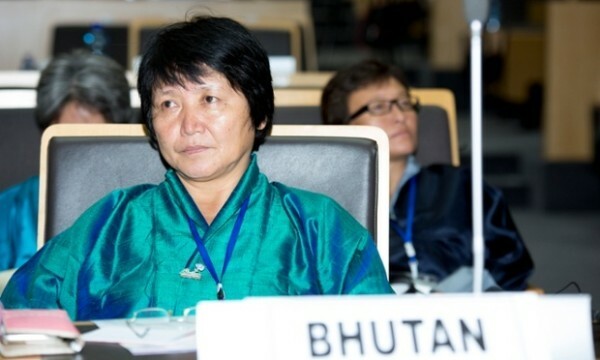 Previously under the rule of King Jigme Khesar Namgyel Wangchuck, who became the Bhutan ruler in 2006 when his father abdicated, Bhutan is very new to the world of democracy and electing a female out of the gate is unheard of around the world! It was the king who personally selected her but she was clearly picked on merit given that she has an engineering background, and she is now working on infrastructure development, water and sanitation. She did her masters studying in Syracuse, New York, has previously worked with the United Nations Development Program and welcomes the opportunity to use her experience to benefit her country. “I think I served well enough in the civil service to understand the country’s issues. And I took it as another platform to serve people,” she said. Because of the country’s emphasis on happiness as a guiding principle, women and girls don’t face the same barriers like in other nations. However there are currently only 6 women serving in a Parliament of 72 members, and that number is almost a double decrease from a few years ago. So Dorji’s election is not only symbolic for the country, but important representation for girls in the country knowing that despite the abysmal gender ratio, there is nothing stopping them from climbing the ladder of leadership. “During my whole career in the civil service I worked with male colleagues, so I do not find this any different. It only requires you to work hard and show your competency,” she said. 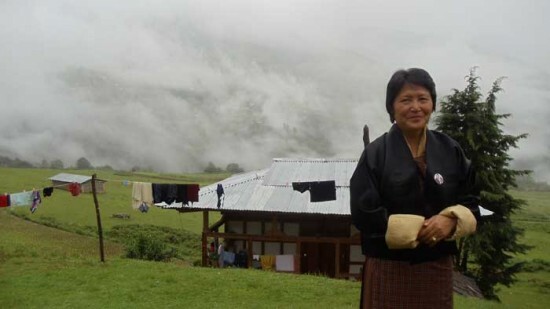 With the government looking at vibrancy of communities, spiritual wellbeing, the conservation of nature and the value of tradition and culture as part of their national success, Dorji says these are areas women can have a key role in. This truly is an empowering story to share because it is a country recognizing the value of a woman by what she can offer, not for her gender specifications. The fact that the nation is Buddhist could also help, as well as the King not being averse to seeing women in top leadership positions. They may be a small country, but already they are showing incredible ways to overcome gender inequality and could be examples for other nations struggling under that oppressive weight. The final example of a female first comes from Jordan. Tima Shomali has been described as the first female comedian from the nation, and made an appearance at the Women in the World Summit in New York on April 24th. In an interview with WITW ahead of her appearance, Tima talks about the barriers she faced from Jordanians for having the audacity to do what she’s doing. With more than 24 million views on Youtube, a quarter of a million fans on Facebook, and close to 70k followers on Twitter, it’s clear what she is saying is resonating with many. “It was very hard in the beginning. When you start something and people aren’t used to it, the first thing they’ll do is attack you,” said the 30 year old. One of her main topics is challenging the idea of what women can do in public. Initially she was met with a lot of hostility but as time went on, more people understood what she was doing and she became very popular for it. “With social media and the Internet, it’s different now. People are more willing to share now. People are able to see stuff online that they weren’t able to see before, because of the restrictions on TV,” she said. Challenging not just gender stereotypes but also cultural restrictions, while balancing her comedy with messages that almost anyone around the world can relate to (including this brilliant sketch about what would happen if Facebook disappeared one day – be sure to click the Closed Caption button) shows other young women in Jordan that there are now ways they can speak out and have a voice like never before. While we believe in bringing attention to important issues, sometimes we have to find clever ways to get the message across. We are in awe of what Tima is doing because she is using comedy as a not-so in-your-face way to share opinions and commentary amongst her community. What are your thoughts on a headline touting a “first female” so-and-so? Is it empowering no matter what? Or are the details worth exploring to find out how it can empower other women? We are always excited to read about women breaking new ground, finding ways to break down stereotypes and claim spaces for themselves in a shared and equal way. It is all about the representation, for us. When girls who are young today grow up seeing women in every industry around the world and know they can do it too, then one more step forward has been made toward gender equality. It can’t be tokenism, and it cannot be a PR stunt. We also can’t focus on the often overwhelming fact that there are still areas of the world in the 21st century where women are yet to achieve parity. But if putting a woman in a certain position for the first time lends itself to empowerment because of her merit, then we believe this is a good thing!